BCM Global Trader has expanded their Business as Resellers for Baby Formula Milk Powder upon multiple requests from our Buyer’s group. The factory begin production and distribution of medicine, vitamins and hospital equipment. 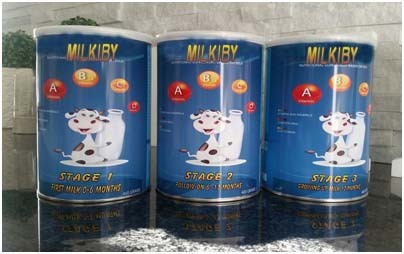 In 2011, they begin developing a new product: a high-quality low-cost baby formula milk powder under the brand MILKIBY. 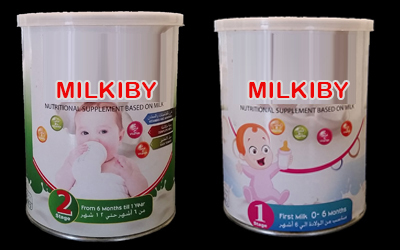 In 2010, as product development was finalized and proper certifications had been obtained, it is registered in Sweden and Great Britain with the purpose of selling, packing and shipping the MILKIBY Infant milk powder in Africa, Middle East and Asia. Logistics: We work with one of them leading suppliers of Logistics and Inland Container Depot (ICD) Solutions in Arab countries. Our primary goal is to provide excellent customer service and maintain long-term relationships because we believe customer satisfaction makes a successful organization. The company is an international shipping company serving almost every type of shipping / land transportation We deliver to both large and small customers worldwide. Activities and capacities in order to facilitate our customers' needs in the most advanced and efficient manner. We produce and offer our customers many different formulations of the baby milk powder. Our products vary in protein content, oils blend type and the set of optional ingredients,. Having the large portfolio of available formulations, we can satisfy requirements of many different markets and customers. 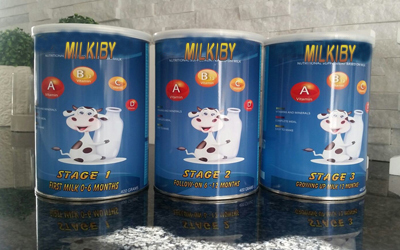 MILKIBY 2 is used as a supplement or replacement for breast milk as recommended by the BVC and covers the nutritional needs from 6-12 month. Milkiby 2 An excellent source of protein and calcium, Instant Skim Milk Powder is fat free milk that has been dried to a fine powder. To prepare 1 cup (250 mL) of skim milk, combine 25g (about 4 tbsp or 60 mL) Bam 2 Instant Skim Milk Powder with 1 cup (250 mL) of cold water. It’s great to take along camping or when traveling. It also makes breads and baked goods extra moist. And of course, it’s the perfect addition to drinks and smoothies. MILKIBY Dairies fat filled milk powder is made from high quality skimmed milk combined with vegetable fat to produce a highly nutritious and functional dairy Ingredient. Milkiby Dairies’ full cream milk powder is produced from fresh pasteurized milk which can be standardized to agreed customer specification.